The game stars the primitive, ever-lovable, , and humungous-headed Bonk. You must traverse through a land filled by the villianous Chikun gang to eventually reach the havoc causing Chikun Base in the sky. Directional Pad - Movement, go figure. 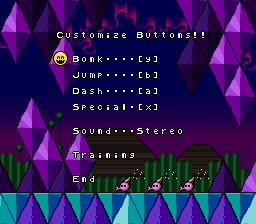 The buttons can be reconfigured in the Options Menu. I was bored 4 days ago and went through a few of my SNES games. I personally thought the game was fun and saw that the translation job would be fairly easy. I'm not entrenched in the Bonk "world" so if I'm inconsistent I'll fix it for the next release. I spent a night dumping it, another hacking in two thirds of the 5.3 KB script and another night finishing that and bug testing. I finally did some touch-ups this morning. The bug testing wasn't to extensive but everything should work right. Here it is folks, the man who dared to challenge Mario and Sonic and failed :P in his own SNES adventure. 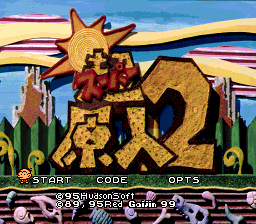 :) Runs fine for me in ZSNES. Oh, and don't ask me for the rom. • The "Ack" yell by Tiny Bonk. I thought the Japanese looked better. Don't worry, none of these are important to playing the game. If you have a serious problem with one of these I don't want to hear it. Unless you have any information on how I can approach these then don't bother complaining to me. 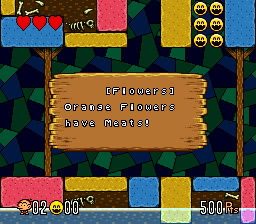 And unless I do figure one of those above items out or I receive Grammatical/Bug Reports consider the game done. Script Extractor, Hex Workshop, SnesTool and Tile Layer were used to make this translation patch possible.